2. When was it issued. 4. The stamp was issued to mark which occasion? 6. His work has been translated into which other languages? 7. If EGEO is printed on the stamps of Italy, can you tell the name of the country it belongs to? 8. What is the monetary unit of Moldova? 4. His 592nd birth anniversary. 5. 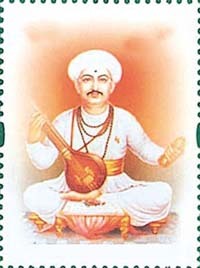 A mystic poet of Maharashtra who was instrumental in taking religion and poetry to the masses. 6. English, French and Germany.